News of the day: Today is the day! I’m excited! 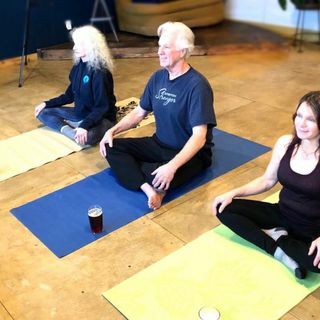 Beer and Yoga is happening today at the Salt Pub at 147 Howerton in Ilwaco at 11:00 am. The marriage of two great loves—beer and yoga. Both are century-old therapies for mind, body and soul! There are a few spaces still available. If you have questions or comments to share with our group post them to our Facebook Group page at RiversZen Online Community, email us at info@riverszen.com or text or call us at 503-440-3554. Here are our classes for both RiversZen studios for Saturday. We are closed on Sunday; but you can find an online class by heading over to www.myriverszen.com. The text of this broadcast is available below or by clicking the "more" link depending on how you accessed the podcast. You will find subscription, training, special offers and other important page links ... be sure to scroll down and check them out. Until Monday, Move Well, Stay Healthy and Be Happy with RiversZen. We'll talk to you then. This episode has no messages yet. Be the first to write a message!